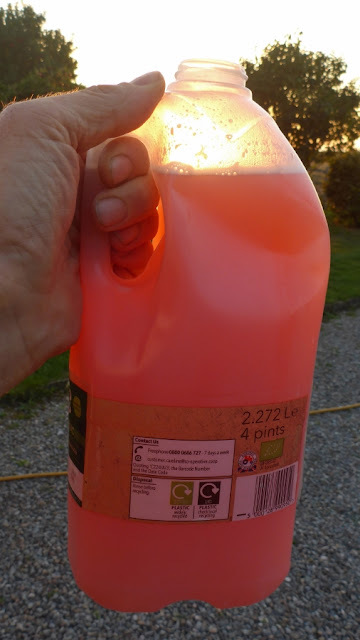 This is the blog of Maunie of Ardwall. 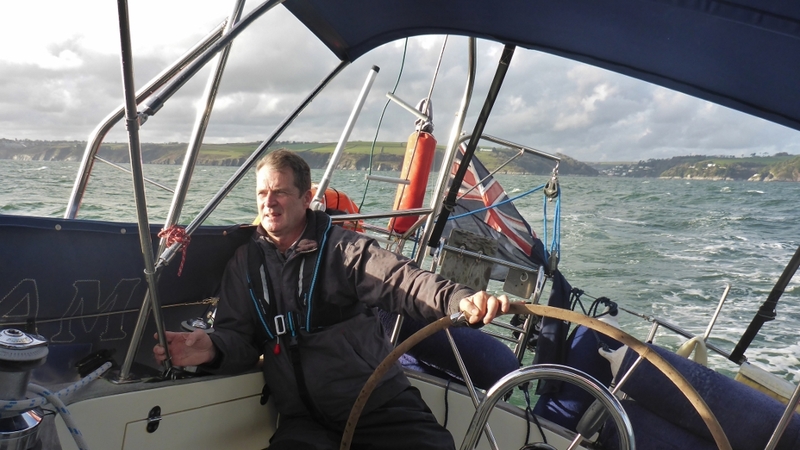 After a six-year adventure sailing from Dartmouth to Australia, we are now back in Britain. Usual trends of English Easter weekends, suffering gales and driving rain, have been confounded this year, we're glad to report, so we've taken full advantage of settled, sunny weather to sail west to Falmouth. Of course, this being a sailing trip, the good stuff has to be paid for in advance, so we spent a couple of hard days on maintenance first. The initial job, to simply reinstall the refurbished heater, turned out to be more complicated, naturally. First, the multi-pin electrical connector socket had suffered terminal corrosion so we had to fit a new wiring loom to the thermostatic switch (Level 3 Bilge Ratting challenge) and then, when we fired up the heater, we could smell fumes coming into the cabin along with the warm air. 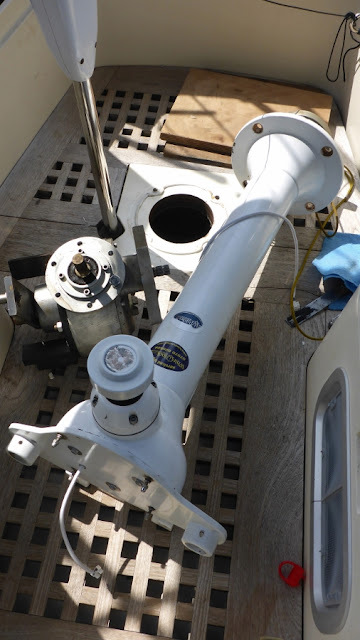 The 21 year-old exhaust pipe was clearly shot, so new components were ordered and a Level 5 Bilge Ratting challenge (Level 5 is the highest) eventually had the old pipe out and a new one installed. 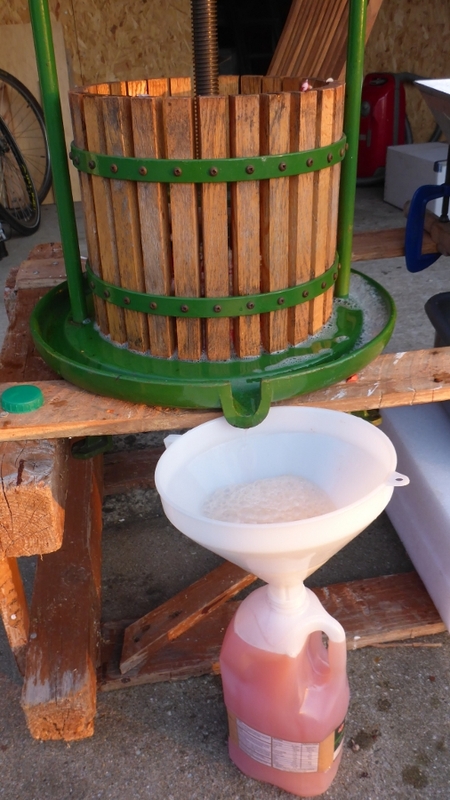 The next day's job was to put Maunie onto the Dartmouth scrubbing grid to clean her bottom of 8 months' of accumulated slime and weed. Unfortunately, we were told that the electricity supply (vital for our pressure washer) wasn't working and so we (briefly) considered a quick-lift for a pressure wash at the local marina until they informed us of the price - £368!! 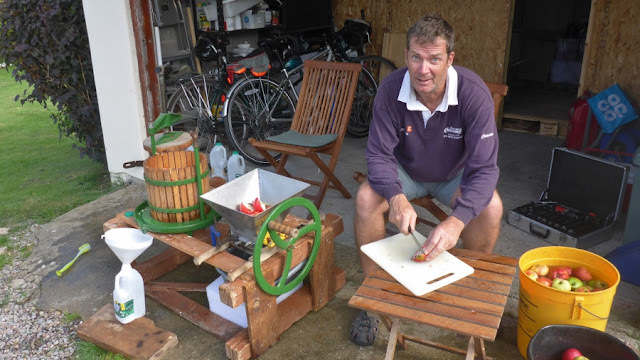 So, with a bit of planning, we used two hose pipes on the grid, one feeding the pressure washer and the other providing a supply of cooling water to Maunie's on-board diesel generator. Perfect and very satisfying. Hard work done, we could go sailing. Lovely. 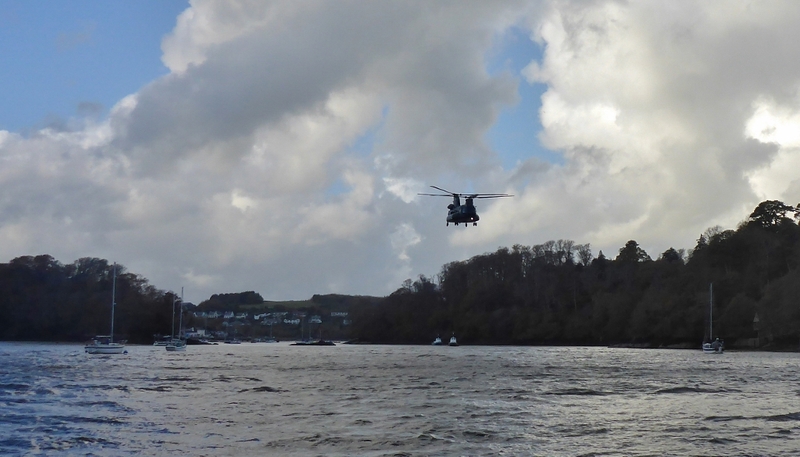 A nice 12-15 knot Easterly allowed us to fly the Parasailor for about half of the 64nm passage to Falmouth and the trip was enlivened by a couple of close encounters. Not the usual sailing vessel to be seen on this coast! The Eddystone Light. 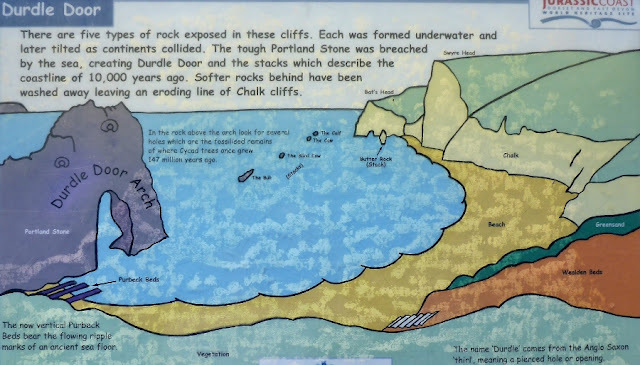 These isolated rocks poke up out of deep water some 15 miles south of Plymouth harbour and accounted for many shipwrecks until the lighthouse was established. 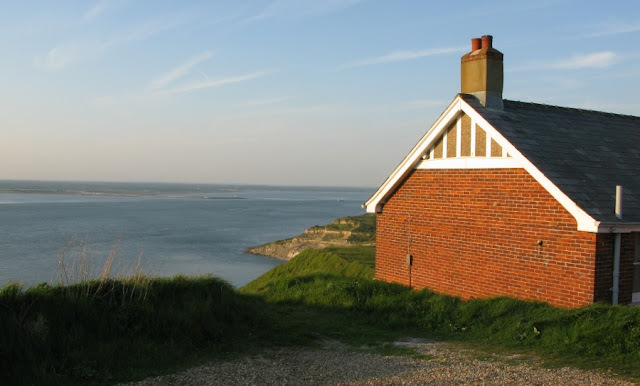 The first light was a wooden structure built in 1698 by Henry Winstanley, a shipowner who had lost two vessels on the reef. 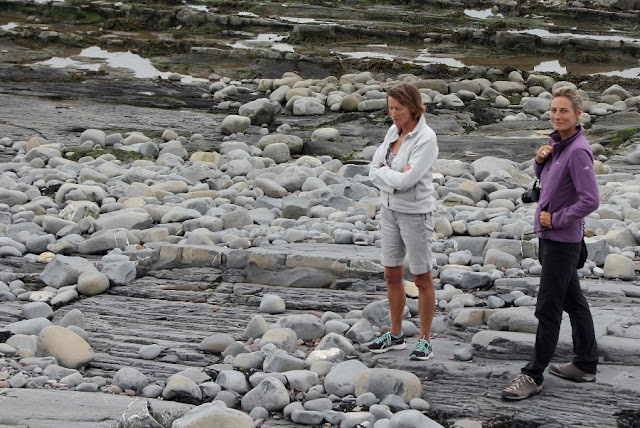 It was washed away in a storm five years later. The current lighthouse was built in 1882 after the rock on which the earlier Smeaton's tower (1760) started to crack. Smeaton's granite tower was dismantled and rebuilt on Plymouth Hoe. So, after a very relaxed and interesting passage, we anchored off St Mawes at 17.30 on Good Friday and have had a completely calm night. We'll spend a few days around the Fal and are looking forward to catching up with friends and seeing Sir Robin Knox-Johnston arriving in Suhaili, the wooden yacht in which he won the first Golden Globe single-handed around the world race 50 years ago. He's planning to cross the finish line again on Monday, exactly 50 years to the minute since his triumphant arrival. 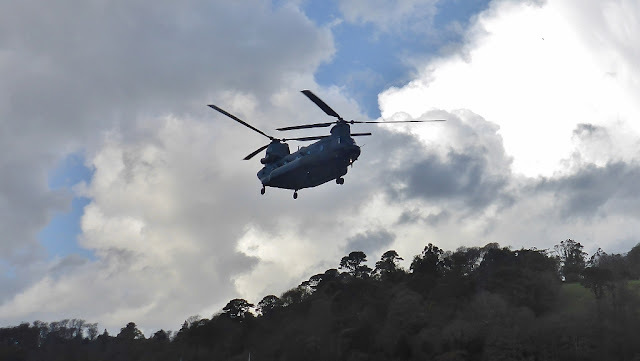 It's been really wet and windy for the last couple of weeks but we saw an opportunity and took a couple of days off work to head down to Dartmouth on Wednesday evening. Thursday dawned bright and breezy, though only about 7 degrees, so we headed out for a couple of hours of entertaining sailing. The inshore forecast gave W to NW F6-7, Gale 8 later, so, unsurprisingly, we were the only boat out! 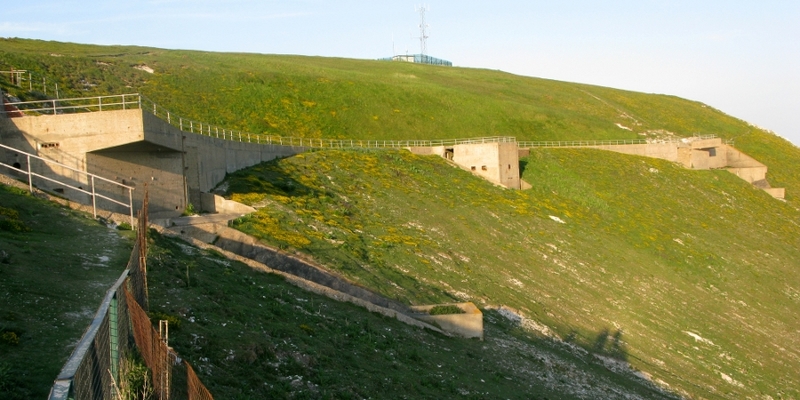 The National Coastwatch Institute volunteers, based in a WW2 gun battery observation post at Froward Point to the east of the Dart entrance, were reassured when we called them on the radio to tell them that we were out for a play rather than setting off on a passage. Maunie is temporarily in residence on a pontoon in the river, rather than on her normal mooring, which allows us the benefit of electricity to run a dehumidifier when we leave her - it make a huge difference as she feels completely dry and free of the dreaded mildew. The ability to run a fan heater comes in handy when we're aboard, particularly as the diesel central heating system has packed up. Graham had a fun couple of hours in the cockpit locker removing the heater (which resembles a mini jet engine - the combustion fumes are exhausted overboard and heated air is ducted around the boat) and we took it ashore for a full clean and service. It looks as though we'll have much more time on Maunie than we thought this year. Graham's job hasn't worked out as he'd hoped, sadly, and so he's decided that sanity and enjoyment of life should prevail. This means we'll get the opportunity to do a refit of Maunie this summer as well as getting some decent UK and Ireland cruising. We'll update the blog as we go. Things are very different a year later. 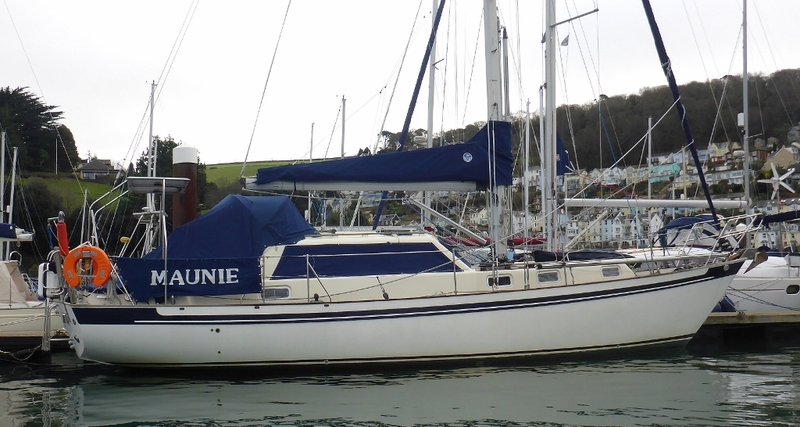 Our lovely Maunie is afloat in another beautiful place but she has her winter coat on. We've moved her to a temporary winter pontoon on the Kingswear side of the River Dart - it still needs the dinghy to access it but comes with an electricity supply so we have a dehumidifier plugged in to combat the damp air. Shame we can't find a plug-in device to fight the green algae that's creeping across the rainwater soaked decks - a scrubbing brush and buckets of seawater have to be manually deployed. We've had a couple of nights aboard this week and were very glad of the electricity supply to power a fan heater as our Eberspacher diesel hot-air central heating decided it wouldn't play ball. It provided another opportunity for Graham to display his contortionist skills as he climbed into the cockpit locker to disassemble various bits of woodwork to access the heater and replace some corroded wiring connectors. After a couple of hours work the heater burst into life, thankfully. Sadly, there was absolutely no wind so ideas of a sail were thwarted and we both were left feeling a tad deflated that we weren't enjoying the bright warm sunshine of Australia. 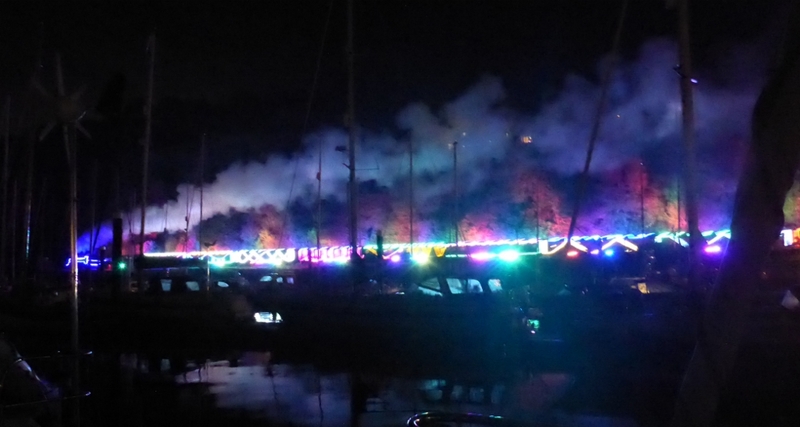 However the evening gloom (it gets dark by about 4.45pm at the moment) was lifted by a whistle and a strange glow on the Kingswear shoreline. We're now back home, celebrating Di's birthday and preparing for a big (1920's-themed) party at the Hood Arms in the village this evening. We're on a table of 18 so it should be a great evening. 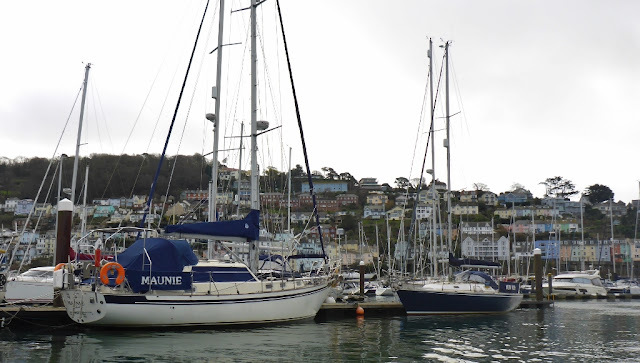 After a pretty hectic summer, getting the hang of both working long hours and sorting house and garden, we finally took this week off and planned for some cruising aboard Maunie. In particular, we'd hoped to make the 95 nm, due south, crossing of the Channel to Treguier in Brittany. The idea was to meet up with Adam & Cindi from Bravo while they were visiting the Boreal yard to see their new boat take shape. Of course, November isn't exactly the best month for crossing the Channel and we had brisk SW and southerly winds all week which whipped up a big, short-wavelength swell. Much as Maunie is well equipped to tackle anything, we didn't feel that being the Beating Keatings for 18 hours or so would be much fun! Still it was good to be living aboard again, even if only for a few days, and our old adverse-weather trick of scooting up river for a pub lunch at the Ferryboat Inn in Dittisham didn't disappoint. We even had an amazing fly-past on the way back - we heard the unmistakable 'wop-wop-wop' of a Chinook helicopter which appeared at only 100 ft above the water. 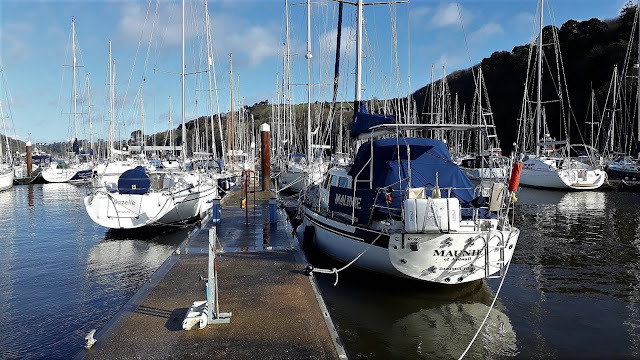 Southerly winds combined with strong ebb tides can result in mildly uncomfortable waves at our mid-river mooring so we took advantage of the cheaper winter berthing rates for two nights in Darthaven marina. This allowed us to plug in to shore power for a fan heater to keep things warm below decks and made the walk to the excellent Steam Packet Inn all too easy. 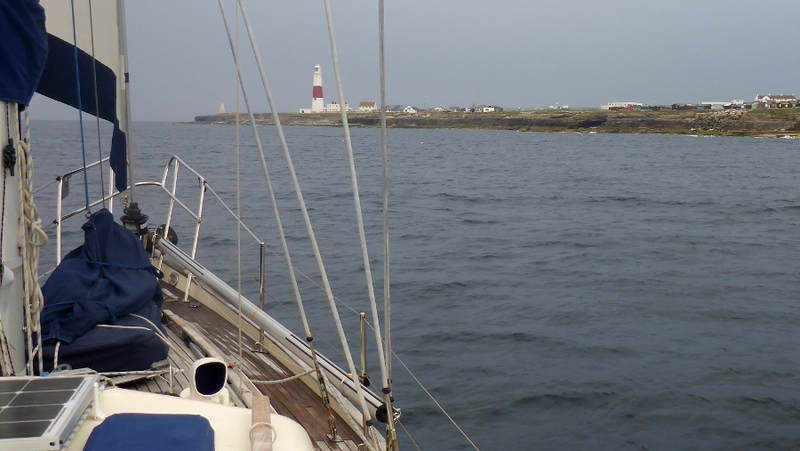 We did get a cracking day-sail in blustery conditions and lumpy seas; strangely we were the only yacht out! We were keen to test out our new addition; yes, we've just spent another dollop of money on the boat (no surprise there, then) but, so far, it feels like a good decision. After our last boat, a Vancouver 34, the only downside of moving to Maunie, from a pure sailing perspective, has been the steering. The 34 had a rudder whose pivot point is set back a few inches from the leading edge to give it some 'balance'. 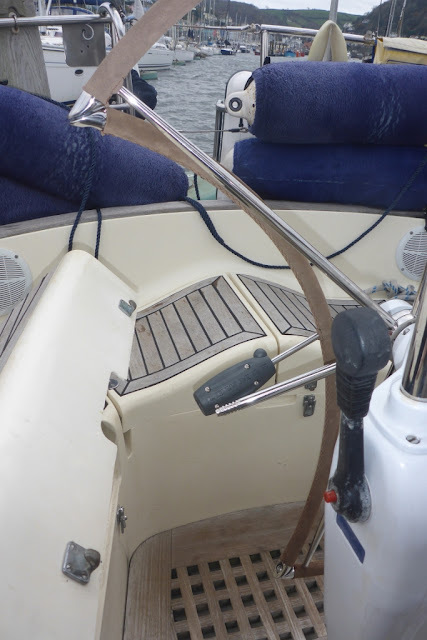 This, combined with the long keel, gave the boat a very easy feel on the helm and superb directional stability. The 38 has a full length skeg supporting its leading edge, so the huge rudder has no such balance and the helm can be a tad heavy at times. The relatively small 30" wheel doesn't help with leverage (and makes it hard to reach when helming from the side of the cockpit) but access to the starboard cockpit locker wouldn't allow a bigger version. However, for a while we've been eyeing the clever but expensive Lewmar folding wheels so we finally made the decision to buy one. 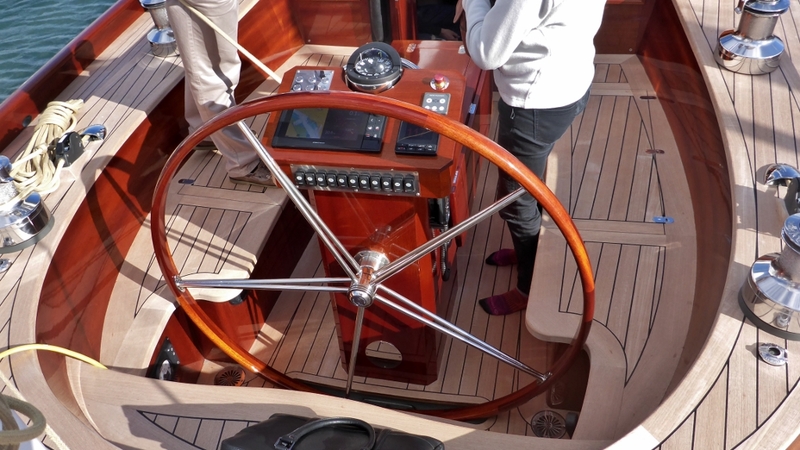 During our first trial sail, we were delighted with the difference that a 40" wheel made to the sailing experience. 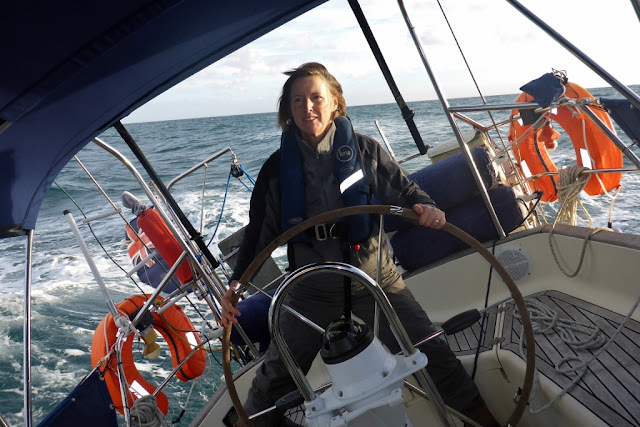 Our week ended up being just a few days aboard so we left, rather frustrated not to have been able to get to France and remembering the challenges of winter sailing in Britain. At the beginning of December we'll move Maunie onto a temporary pontoon mooring for four months - it comes with the luxury of electricity so we'll be able to keep a dehumidifier on board and have a heater running when we're there.Just as well, we think, if the media reports of a very harsh winter are to be believed. Meanwhile the current weather is amazingly mild for the time of year and, returning home, the mower came out to deal with the still-growing lawn and the dead leaves scattered over it. We've certainly joined the ranks of the time-poor! Where do the weeks go, exactly? 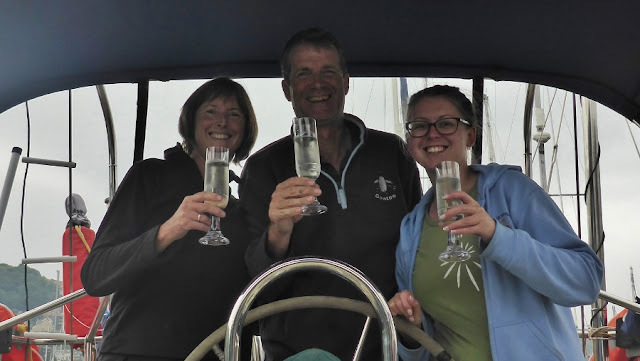 After our extended sailing trip, where time each year seem to last at least eighteen months, we are back into the familiar routine where a year chopped up into working weeks seems to last about six! 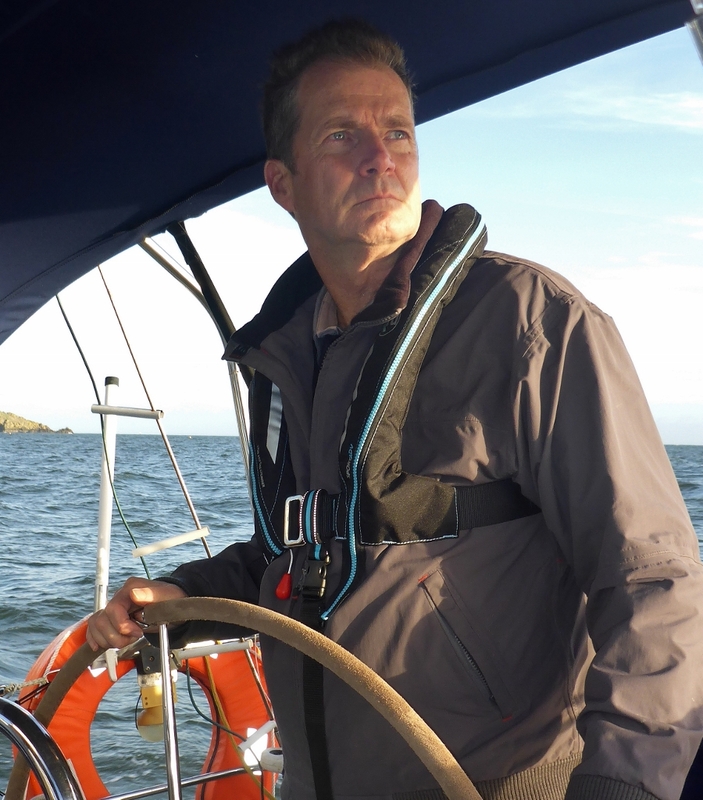 This working-for-a-living malarkey is all well and good but it does get in the way of the sailing rather. 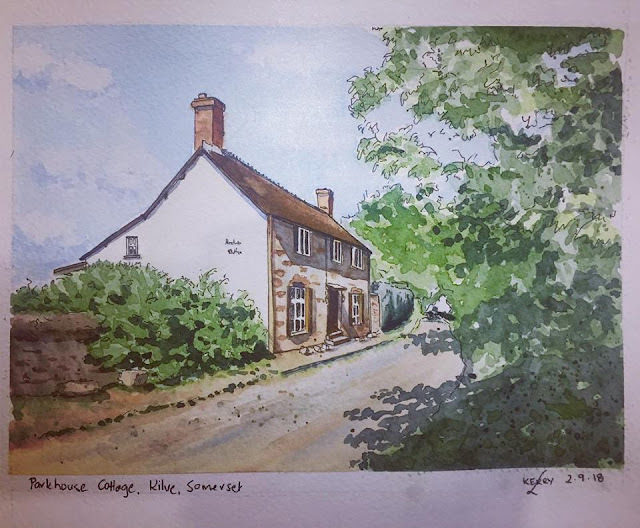 Still, whilst our sailing is reduced to weekends and the odd extended weekend, it's lovely to be back on the beautiful southwest coast of England. We're also enjoying the Somerset countryside which had turned an unusual shade of parched brown at the end of the amazingly hot and dry summer but is now back to its more common lush green. Our links to the Pacific sailing world remain strong, with regular contact with sailing friends and even a couple of visits. 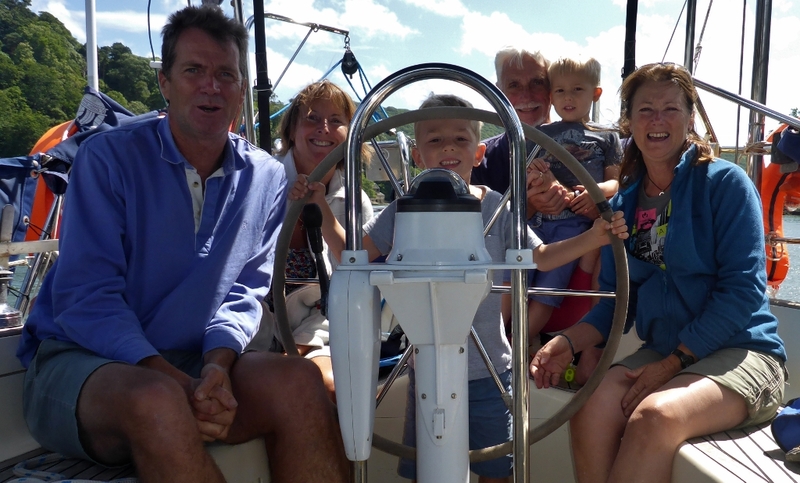 Firstly we had Ana and Colin (ex Ithaka) who had a family get together in a cottage in Dittisham, a couple of miles up the River Dart from MAunie's mooring, and joined us aboard Maunie with their two grandsons for coffee. 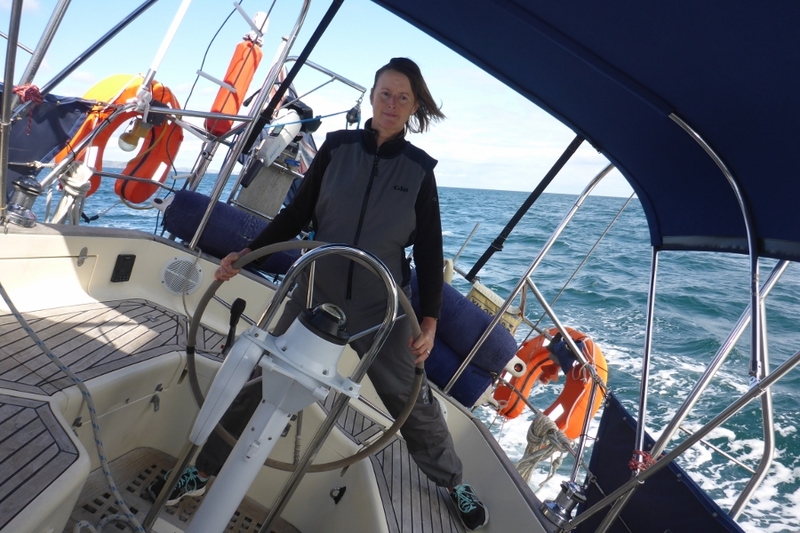 Then Kerry (ex Sel Citron) came to stay and enjoyed a mix of local hikes and some good sailing. 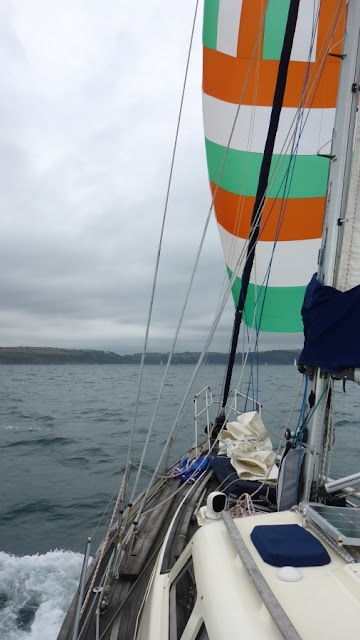 Whilst we haven't managed a planned trip across to southern Ireland, we did have an excellent, four-day mini-cruise to Falmouth and back which reminded us just how good the local sailing is around us. Di enjoying the sail as we beat to windward. It definitely feels suddenly quite autumnal, so sailing now involves waterproofs and warm layers which comes as something of a shock after six years of t-shirts and shorts. 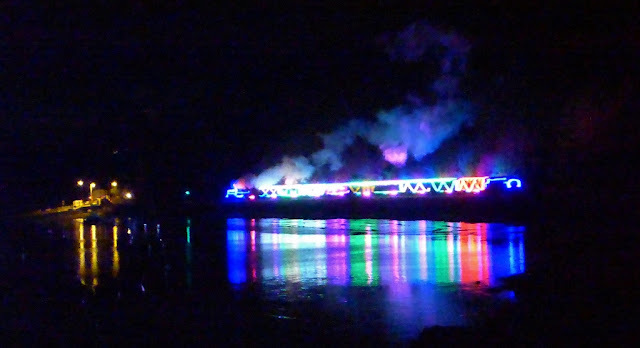 However Maunie is definitely the right boat for these conditions and the central heating has been tested already! Finally, we drove down to Southampton on Friday to visit the Boat Show. 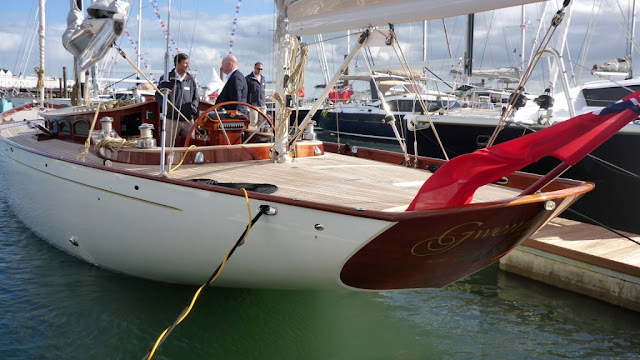 We were mostly looking for kit suppliers and ideas for the refit that well be doing to the boat over the next year or two but, of course, we had to look at a few other boats just to compare. We genuinely didn't find anything we'd want to swap Maunie for apart, perhaps, for this beautiful wooden 63ft yawl built by Spirit Yachts in Ipswich. Access to these kinds of boats at the Show is usually reserved for those who have pre-arranged a private viewing (and presumably passed the finance test) but one of the Spirit Yachts team saw us admiring her and invited us aboard. 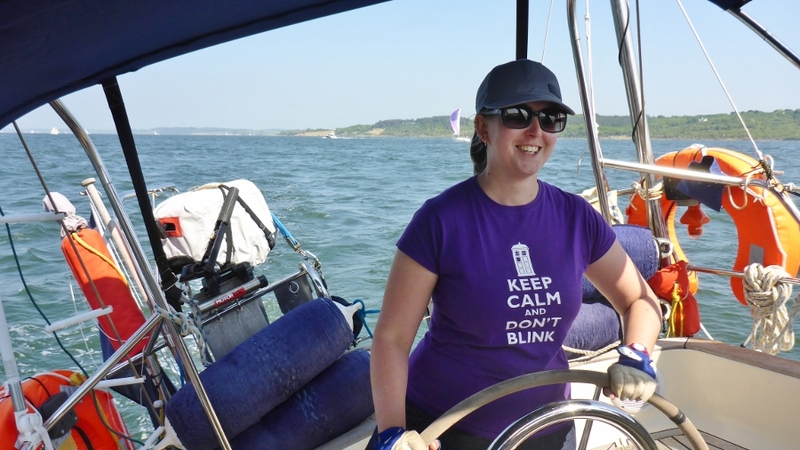 A different kind of sailing altogether! We're avid followers of the amazing Volvo Ocean Race, where seven identical 65ft racing boats have already covered over 40,000 miles around the globe. Makes our pace on Maunie look a tad slow but there you are. 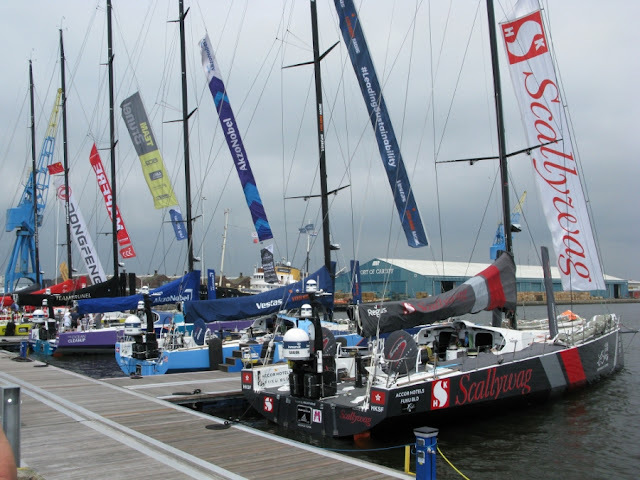 Anyway, for the first time in ages one of the stop-overs was in the UK this year so last Saturday we drove over to Cardiff to visit the race village and see the fleet. 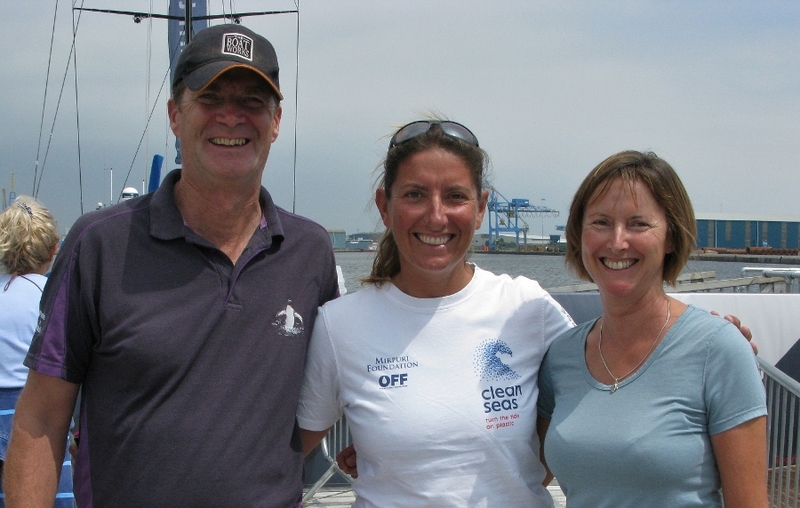 We were really delighted to meet Dee Caffari, the amazing skipper of Turn the Tide on Plastic. We last met her in Auckland 3 years ago when she was one of the crew of an all-women team on SCA and this time she's led a young and pretty inexperienced crew in the world's toughest yacht race. Dee's boat - rather wider than Maunie! The following afternoon the boats left Cardiff for the start of the 1300 mile race to Gothenburg in almost flat calm. In the early evening we could see a couple of their sails, moving very slowly on the horizon, from our garden. 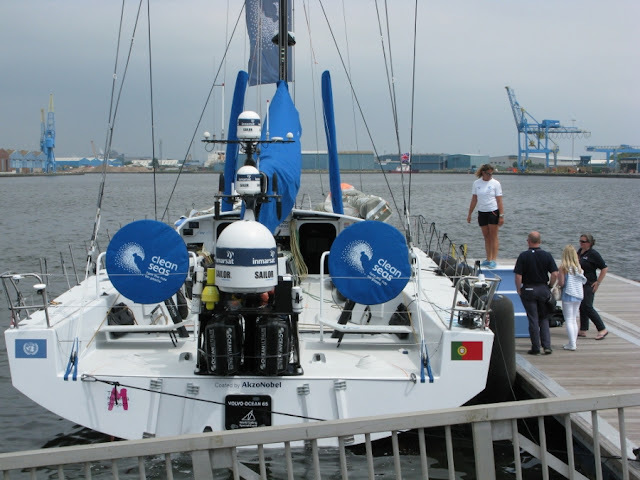 They have been moving rather faster in the last 26 hours as they race across the final miles to Sweden. The last couple of weeks have been eventful! Having unloaded Maunie from the ship (and finding, to our relief, that she was in excellent condition) we moved her across to Hythe Marina for a week and promptly started dismantling her. Well, her steering system at least. Pedestal and gearbox, restored to smooth operation, ready to be refitted. Graham, ever enduring the engineer's curse of hating it if something doesn't work just as it should, had tried to adjust the steering in Australia - we had an annoying inch of play in the wheel at the straight-ahead position and the wheel brake (vital to keep the rudder locked when we are using the Windpilot to steer the boat) was slipping. Unfortunately, the vital component that is supposed to slide, easily, off when four bolts are undone had decided that it didn't want to part company with the pedestal after 20 years in situ. So the first job on our return was to unbolt both pedestal and gearbox and take them to Cliff, a local engineer who specialises in Whitlock steering systems. This, of course, was easier said than done as one bolt - and it had to be the most inaccessible one, didn't it? - refused to undo and had to be treated to the application of an angle-grinder. Anyway, after that hot and dirty afternoon spent upside down in the cockpit locker, the kit was finally removed and delivered to Cliff who, three days's of work later, pronounced it fully refurbished and good for another 20 years. Of course, having no steering for a few days meant that we couldn't sail anywhere so we were very lucky that friends Steve and Barbara (veterans of several sailing trips on Maunie and our previous boat across to Ireland, up to Scotland and in NZ) had booked a National Trust holiday cottage on the Isle of Wight for the week so we took the passenger ferry across to Cowes and had two lovely days doing long walks on the island.The cottage was once used by coastguard staff at the Needles, at the very western tip of the island, so we had splendid views and no shortage of wind. 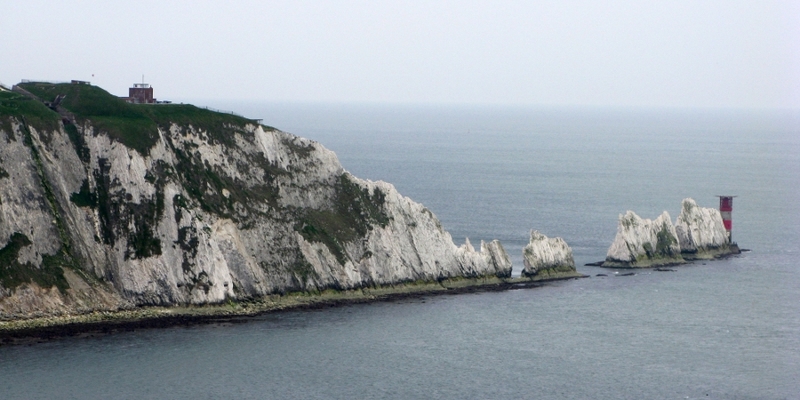 We absolutely loved the Isle of Wight. The geology is fascinating and the land, in many places, is definitely on the move. There are some huge landslides, old and very new, around the coast which must make the owners of some otherwise-delightful holiday houses feel distinctly nervous. 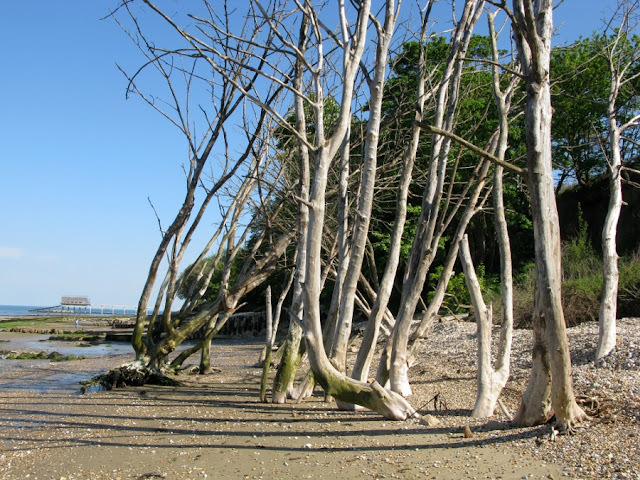 At the NE end of the island we found woodland that had slipped into the sea, leaving the trees suddenly drowned in sea water and, apparently, rooted in a beach. 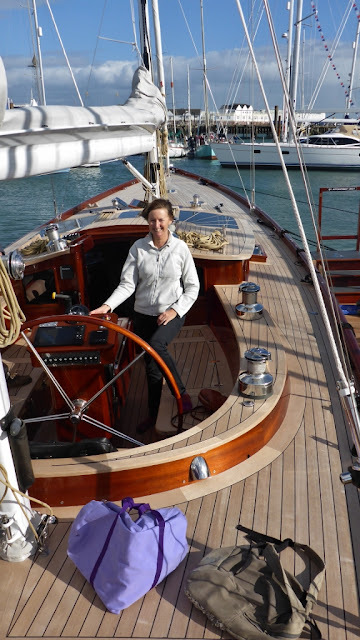 After a great couple of days with Barbara and Steve we returned to Maunie, collected niece Laura (ace crew from NZ to Vanuatu a couple of years ago), refitted the steering and headed west in gentle winds and calm seas. A stop-over in Poole allowed us to catch up with Sue and Laurie, Graham's aunt and uncle, and then, with weather conditions remaining benign, we had two nights at anchor in Lulworth Cove to continue the geology field trip. 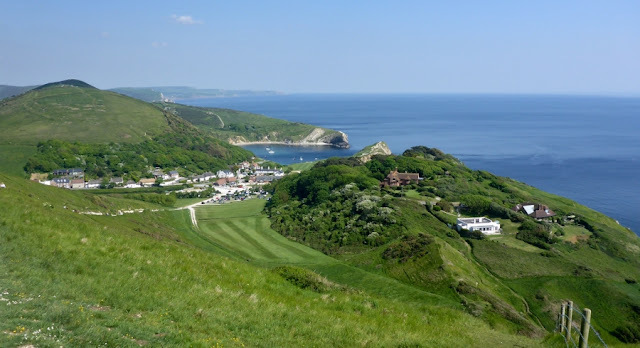 Looking back towards Lulworth - a popular spot. From Lulworth we moved round to the lovely Georgian port of Weymouth, where we berthed on the pontoon featured early in the recent film Dunkirk, and that allowed us an early morning start to round Portland Bill. The Bill has a well-deserved reputation for dangerous sea conditions - tides can run at up to 10 knots in the shallow race just off its tip so it's vital to round it at just the right time of tide. The options are to stay very close to the shore to stay inside the race or else to go about five miles off. Naturally we opted for the inshore option and did it under sail. Rounded! 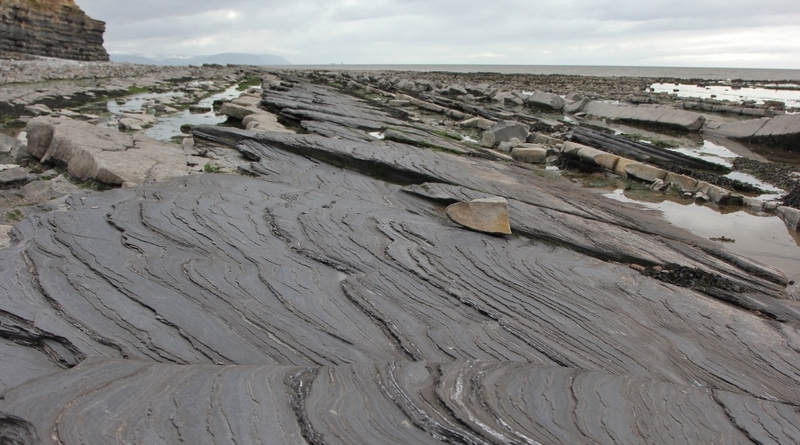 The technique is to pass so close to the flat rock that you could throw a biscuit to the seagulls sitting on it. 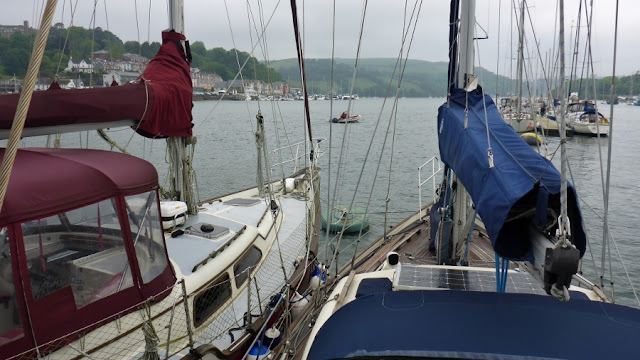 Finally, at 14.40 on Thursday 24th May, we returned to our home port of Dartmouth, just under six years after we left. It felt a little anti-climactic, to be honest; we'd hoped to be returning having done the whole circumnavigation (in which case we'd be expecting brass bands and naval salutes) but it still feels that we've had quite an adventure. 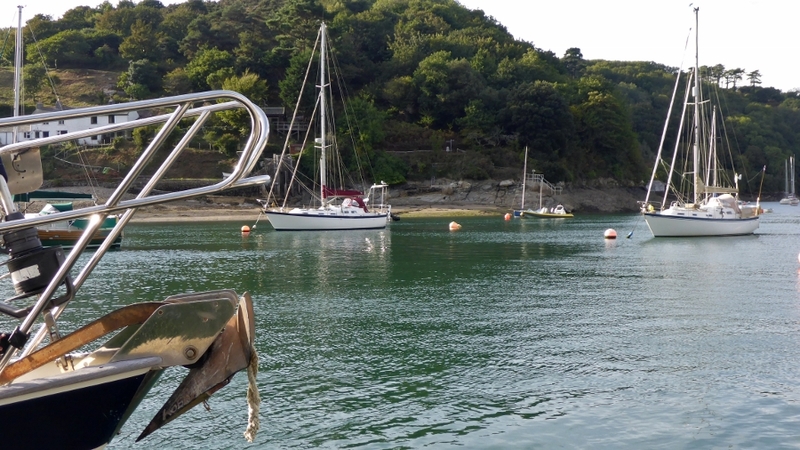 Maunie's new mooring on the Dart, on a fore and aft trot mooring, alongside a 40' boat called Olive. The pontoon upstream is for visiting boats. So, this chapter of our lives draws to a close for now. 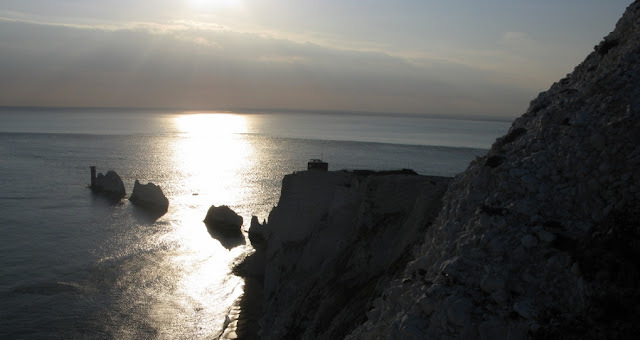 We're looking forward to re-discovering some more wonderful sailing destinations on this beautiful coastline but, sadly, our time will be limited to weekends and the odd week here or there. We'll post the occasional update on this blog but, for the moment, would just like to thank you for following our voyage and sending supportive comments. We hope that you have enjoyed the adventure as much as we have! Maunie is our Vancouver 38 Pilot, launched in 1997 and bought as a restoration project in 2009. The main trip of 2010 was to Ireland and a year later we were across to Brittany and the Channel Islands. 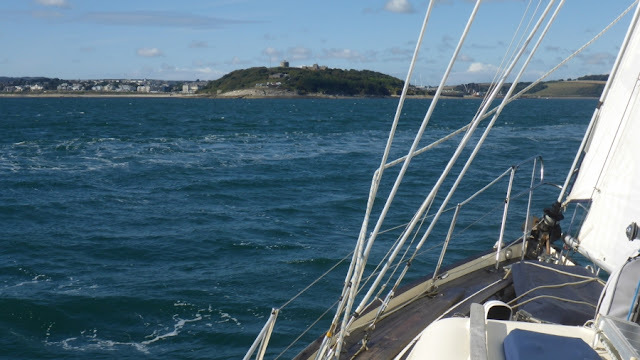 2012 was the start of the Big Trip - leaving Dartmouth in August, we left the Canaries for St Lucia in November. After the 2994 mile crossing, we explored the Caribbean and moved to Panama to transit the Panama Canal into the Pacific; we arrived in New Zealand in October and spent 6 months exploring, by boat and by car, before heading back into the Tropics. 2014 saw us enjoying cruising in Tonga and Fiji and we returned to New Zealand for the summer (plus a flight home to see family and friends in February). We loved Fiji so much that we returned in 2015 to revisit some favourite places. After a third summer in NZ we explored Vanuatu in 2016 before heading to Australia, sailing south from Bundaberg to Tasmania. In April 2017 we left Maunie to fly back to England for 6 months before returning to Australia for more sunshine. In May 2018 we shipped Maunie back to England to return to work but we're still sailing from our Dartmouth home port.